Daryl Gaunt began working with dogs by decoying for Inglewood PD in 1978. 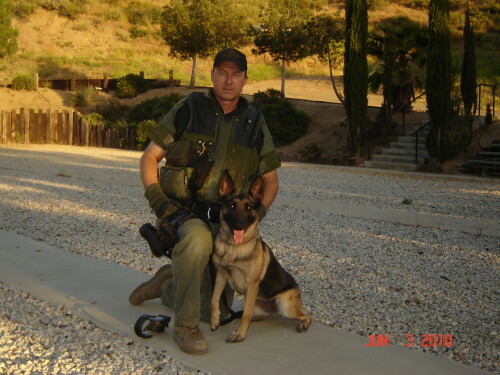 He also worked with the Los Angeles Schutzhund Club where he held the position of Vice President and Assistant Training Director. He then went into the Army for eight years and was a military dog handler for four years. He has worked as a Deputy Sheriff for Los Angeles County since 1991 and has been assigned to the Special Enforcement Bureau canine unit since 2003. He has been a unit trainer since 2005 where he helped establish their Tactical K9 school. He is currently working his third SWAT patrol dog. In addition, Daryl has worked for Adlerhorst International since 2005 as an instructor. He is a California POST evaluator and has certified hundreds of dog teams from all over the country. He has instructed military and civilian teams both in the United States and internationally.